Ramen Jiro. Where do I start. After waiting 45 minutes, you are presented with a limited menu. Actually, it's all the same, but you can choose omori, big size, and more pork. Don't get anything but the base size and pork level. Seriously. Look at the customers inside. Most don't even finish. This is some brutal stuff. I have mine yasai ninniku mashi. How is it? It's soul crushing deliciousness. The noodles are thick thick thick. This means heavy. But the noodles aren't even the destructive past. The broth is like you took a ham and pureed it. Then simmered some pork bones in this puree for a couple days. Then maybe added just a dash of pork chops to the final product. I don't think it's kosher. Don't plan any activities that require movement of your body after eating here. I went to the Ikebukuro Jiro, I would recommend going to the movie theater that is 50 meters away. Maybe take a taxi there. Or go sleep in the park which is just down the street. 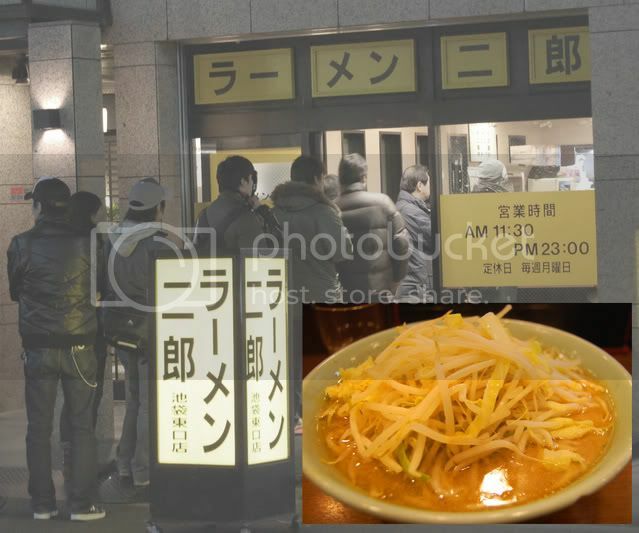 Ramen Jiro is considered somewhat of a mecca for many people. There are locations all over the place in the Tokyo area, and each one always has a lineup. This place is required eating. You might hate it, or the atmosphere of a shop filled with guys sweating out all that they are taking in. But you need to try. If you love it, well then go on an adventure of your own to all their locations. A perfect score from rameniac.